Rashid Temrezov was born in March, 14th, 1976 in Cherkessk. In 1998 he graduated from the Moscow open social university. Then worked in a commercial department of Open Society "Karachay-Cherkess-OilProduct", as sales manager of building management, the head of department of Open Society "NothCaucasusHidroEnergeticConstruction". 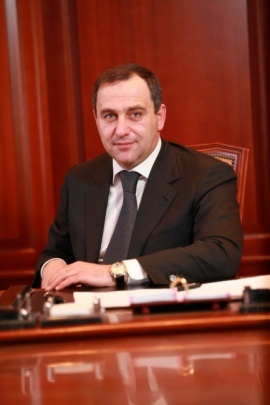 2004 R.B.Temrezov held a post of the general director of republican official body "Management of capital construction of Karachaevo-Circassian Republic", then the general director of Open Society "Electrotechnical company". On January, 2010 he has been appointed as a chief of "Management of Federal road agency to territories of Karachaevo-Circassian Republic". On February, 26th, 2011 Temrezov Rashid Borisbievich by the Decree of the President of the Russian Federation Dmitry Medvedev was appointed a temporarily acting President of Karachaevo-Circassian Republic. On March, 1st, 2011 approved by deputies of Parliament of Karachaevo-Circassia on a post of the President of Karachaevo-Circassian Republic. Since 4.7.2011 is the Head of Karachaevo-Circassian of Republic (according to the Constitutional Law of Karachaevo-Circassian of Republic �About modification in the Constitution of Karachaevo-Circassian of republic � about renaming a post of the supreme official of republic.